Memes have flooded the internet with two pictures comparing “lithium mines” with “oil fields” to set the stage for the argument that your electric vehicle has an equally negative impact on the environment. 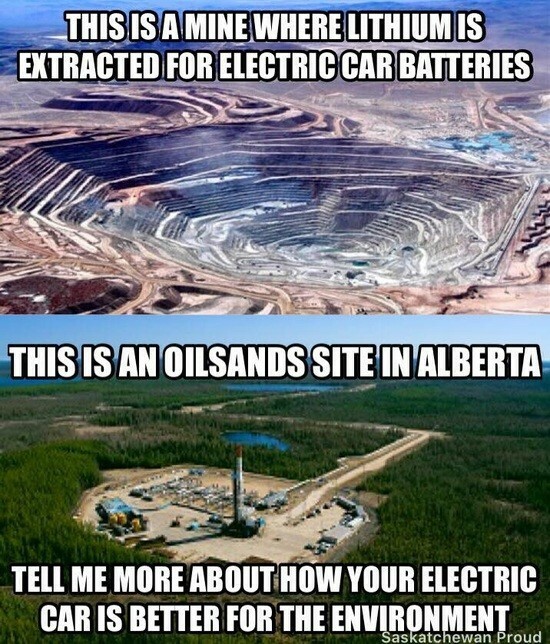 Aside from the fact that the picture is actually that of a copper mine, something we consume over 19 million tonnes of annually and not a lithium mine, something we consume barely over 650,000 tonnes of annually, the meme’s representation of oil extraction is horribly skewed as well. The oil field in question might look pretty from a helicopter shot, yet it is a picture of one tiny segment of the oil extraction process. Oil extraction can be done in two main ways. One involves using heat, usually steam to drive oil out from black semi-solid tar which is found in tar fields. 1500 cubic feet of natural gas is used to generate just 1 barrel of oil. The other way is mining. Blasting, trucks, crushing of rocks, a mixture of hot water and caustic lye (sodium hydroxide) is added to the tar fields. It’s all mixed up into a black, sandy paste, then the paste is piped over to a plant where it gets churned until the oil floats to the top. Then the oil gets sent down some fine pipeline while the remaining muck is dumped. It takes about two tons of sand to make a single barrel of oil. As for Lithium extraction, it exists mostly in the form of concentrated salts. Almost all that lithium (over 95 percent of it) is produced through a process of pumping underground brine to the surface and allowing it to evaporate in big pans. It’s separated from the brine using electrolysis. There’s nothing you would think of as mining. No blasting. No trucks driving around carrying loads of crushed rock. No sprays of sulfuric acid. The primary sources of lithium are from the Atacama Desert in Chile and the Uyuni Salt Plains in Bolivia. In these two places, researchers used the same spaceships that were sent to Mars to detect life to see the presence of biodiversity in both areas. In both, they found nothing, aside from a small number of salt resistance shrimp. In fact, a few years after the survey a group of flamingoes began to reside in one area of the Atacama. After that point the area was promptly converted into a national park. Lithium which is used to make batteries that will hopefully power our vehicles has a relatively lower ecological impact compared to oil extraction. No one is calling it a utopian solution, it will have its own problems, yet the ones peddled by individuals with a surface knowledge of the matter are yet to have any real impact on the public perception of electric mobility and should be hastily discarded. India’s Biggest Bike Mela is Back with a Bang!